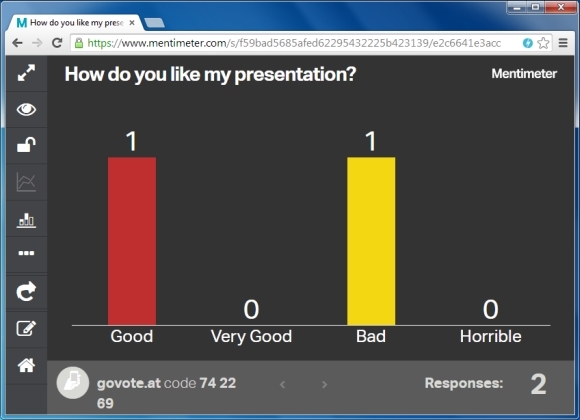 Mentimeter is a free web based online voting system for quickly and easily conducting polls during a live presentations. 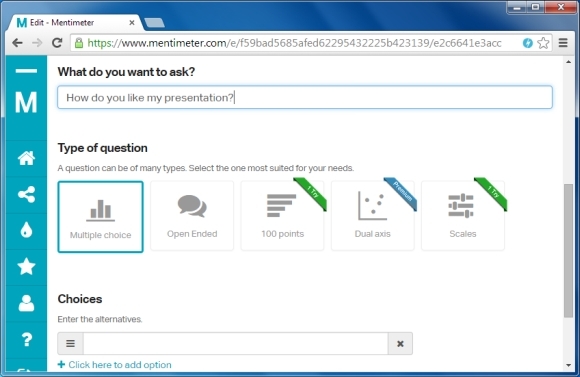 While we have already covered a comprehensive list of tools with different modes of voting in our post about Best Polling Software and Solutions for Live Presentations; the good thing about Mentimeter is that its free version is good enough for comprehensively conducting polls during presentations, without a hefty price tag or complicated configurations. 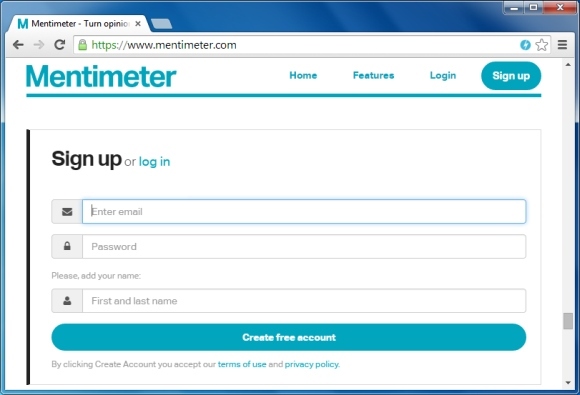 Like most web apps you will require signing up for a Mentimeter account. After you login to your account you will also be given a quick tour to help you understand how Mentimeter works, you can also go through the quick guide to get a headstart. Now, go to your Dashboard and select Create Question. 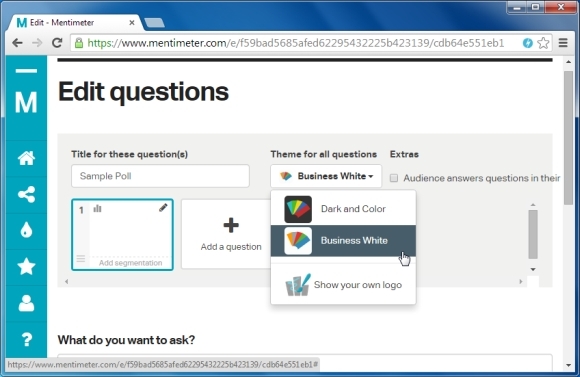 You can also see the sample questions to get an idea about how Mentimeter works. You can add one or more question(s) for your presentation and specify the theme that you wish to use, as well as the polling mechanism you intend to use. The available polling options include Multiple Choice questions, Open Ended questions, Dual Axis, Points and Scales. As you can see from the image given below, some of these questions are not available in the free version. Needless to say, you will require specifying question choices where applicable. For example, the below image shows a multiple choice question with answer choices I added. Once your questions are ready you can either save them and return to Dashboard or click Start Presentation to proceed further. 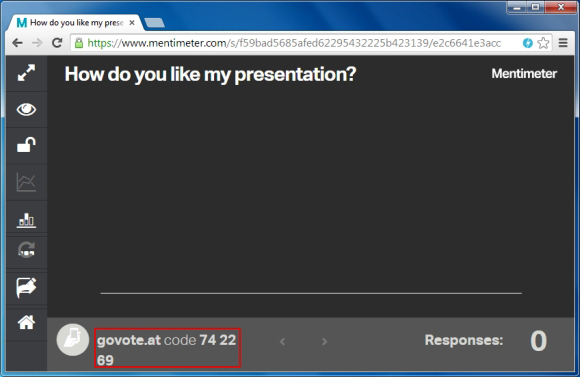 Once you click Start Presentation, your poll will go Live. Just give the mentioned URL and polling code to your audience and you are good to go. The below image shows an Android device being used to cast a vote. Your audience can use any internet connected device to cast their votes by going to ‘govote.at’ and entering the relevant polling code. This will allow them to submit their answers. 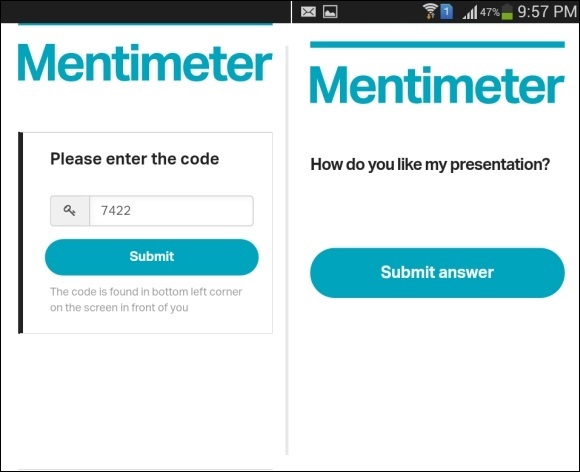 To take Mentimeter for a spin, see the link given below. 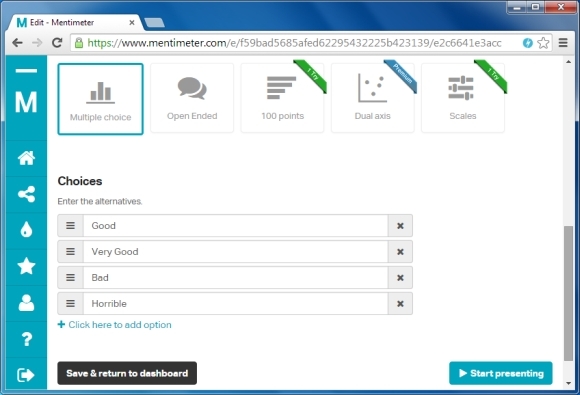 As mentioned earlier, Mentimeter has both a free and paid version, however, the free version covers basic voting options which are good enough to help you conduct polls based on multiple choice and open ended questions, with real-time voting results.